Quảng Bình ([kwa᷉ːŋ ɓɨ̂n]), formerly Tiên Bình under the reign of Lê Trung Hưng of the Lê Dynasty (this province was renamed Quảng Bình in 1604), is a province along Vietnam's north-central coast. The province has an area of 8,065.8 square kilometers and population of 857,818 inhabitants (as of 2008) The province is bordered by the Laotian Khammouane Province to the west, the North Pacific Ocean to the east, Hà Tĩnh Province to the north and Quảng Trị Province to the south. Historically, this region belonged to Văn Lang and later the kingdom of Champa. Later it was claimed by both the Đại Việt and Champa and officially annexed into Đại Việt by Lý Thường Kiệt, a Lý Dynasty general (under the reign of Lý Thánh Tông). The site of present-day Quảng Bình was battlefields between Champa and Vietnam until the Vietnamese territory was expanded further south by subsequent dynasties. Quảng Bình's importance expanded after Nguyễn Hoàng, a prince of Nguyễn lords was sent to the south by a king of the Lê Dynasty. Hoàng built his estate and turned it into Đàng Trong, a rival of the de facto Trịnh-controlled Đàng Ngoài. Quảng Bình became an important front to defend Đàng Trong from attack by Đàng Ngoài. Under French rule, this province was part of Annam. 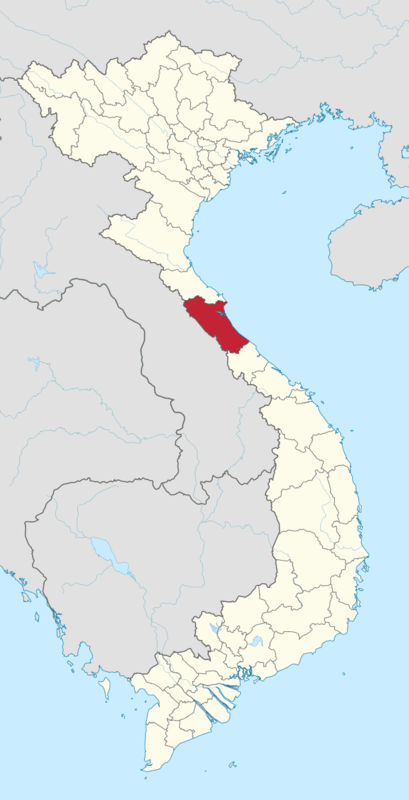 During the Vietnam War, this province was part of the Democratic Republic of Vietnam (aka North Vietnam), only 20 km from the DMZ. This province was severely devastated by bombing from U.S. B-52s. This province is home to the World Heritage Phong Nha-Kẻ Bàng National Park. The province is also home to several famous Vietnamese persons, including general Võ Nguyên Giáp, poet Hàn Mặc Tử, writer Bảo Ninh and the family of former South Vietnamese president Ngô Đình Diệm. Coordinates 16°55’ to 18°05’ North and 105°37’ to 107°00’ East. It borders Hà Tĩnh Province on the north with the Ngang mountain pass as the natural frontier, Quảng Trị province to the south, Laos to the west, and faces the Dong Sea to the east. The narrowest part from east (seaside) to west (Laotian border) is just 40 km. The provincial topography is characterized by a general slope, higher in the west and lower in the east, with hilly and mountainous areas accounting for 85% of the total area. The Annamite Range is the natural border between Quảng Bình province and Laos with peaks ranging from 1,000 to 1,500 m, the summit of which is peak Phi Co Pi with the height of 2,017 m. In the east of the province are lower hills and then several narrow plains and river deltas. The seaside sand dunes belt is a natural dam that protects the land from the ocean tides. Sand area accounts for 5.9% of the land, and alluvial soil accounts for only 2.8% of the land. The province's east coastline is 116.04 km long and the western borderline with Laos is 201.81 km long. The province owns 4866.88 km2 of forests, of which 4478.37 km2 is natural jungle, and 388.54 km2 is reforestation (including 175.97 km2 of pines). The coastline is 116.04 km on the east, the borderline with Laos is 201.87 km on the west. Most of the rivers originate in the Truong Son Range and empty into South China Sea. River and stream density is 1.1 km/km2. There are some 160 natural and man-made lakes with total water deposit of 234.3 million cubic meter of fresh water, Quảng Bình Province's sea area includes continental shelf and special economic area up to 20,000 km2. Off the sea, there lie Hòn La islet, Hòn Gió islet, Hòn Nồm islet, Hòn Cỏ islet, Hòn Chùa islets with the total fishery capacity of 100,000 metric tonnes. Hòn La bay is a 4-square-km marine bay with the depth up to 15 m and a surrounding land of 4 km2 suitable to develop sea deep-water port and industrial park. The Hoành Sơn Mountains run through the northeastern part of the province. Many mount summits concentrate in Phong Nha-Kẻ Bàng area with over 1,000 metres height. Noteworthy peaks are the Peak Co Rilata with ta height of 1,128 m and the Peak Co Preu with a height of 1,213 m. Mountains in karstic area of the park rise at typical height of above 800 m constitute a continuous range along Laotian-Vietnamese borderline, of which notable summits above 1000 m are: Phu Tạo (1174m), Co Unet (1150m), Phu Canh (1095m), Phu Mun (1078m), Phu Tu En (1078m), Phu On Chinh (1068m), Phu Dung (1064m), Phu Tu Ôc (1053m), Phu Long (1015m), Phu Ôc (1015m), Phu Dong (1002m). Inserting into these summits are 800–1000 m high summits of Phu Sinh (965m), Phu Co Tri (949m), Phu On Boi (933m), Phu Tu (956m), Phu Toan (905m), Phu Phong (902m), and Ma Ma (835m). There are four separate seasons here: in spring (from February to April), it is warm with slight rains, humid and the temperature around 18 to 25 degrees Celsius. In the summer (from May to July), it is hot, dry with little downpours, the temperature may reach up to 35 to 36 degrees Celsius. In the fall, it is rainy, cool with temperature around 22 to 28 degrees Celsius. In the winter, it is humid, slight rain with temperature about 12 to 16 degrees Celsius. Annual average precipitation is around 2,000-2,300 mm. Heaviest rainy season is from September to November. From April to August is the dry season. The hottest months are from June to August. Quảng Bình Province is endowed with biodiversity, especially typical of Annamites eco-region. According to the results of initial surveys, the primary tropical forest in Phong Nha-Kẻ Bàng is home to 140 families, 427 genera, and 751 species of vascular plants, of which 36 species are considered endangered and listed in the Vietnam's Red Data Book. The most common tree species in this park are Hopea sp., Sumbaviopsis albicans, Garcinia fagraeoides, Burretiodendron hsienmu, Chukrasia tabularis, Photinia arboreum and Diospyros salletii. Seedlings can only grow in holes and cracks in the limestone where soil has accumulated, so in general regeneration after disturbance is slow. The forest type in this national park is dominated by evergreen tree species with scattered deciduous trees such as Dipterocarpus kerri, Anogeissus acuminata, Pometia pinnata and Lagerstroemia calyculata. In Phong Nha-Kẻ Bàng, the dominant plant families are the Lauraceae, Fabaceae, Theaceae and Rosaceae, with some scattered gymnosperms such as Podocarpus imbricatus, Podocarpus neriifolius, and Nageia fleuryi. In the national park there is a 5000-ha forest of Calocedrus macrolepis on limestone (Calocedrus rupestris) mounts with about 2,500 trees, 600 per hectare. This is the largest forest of this tree in Vietnam. Most of these trees here are 500–600 years old. These trees are listed in group 2A (rare, precious and limited exploitation) of the official letter 3399/VPCP-NN dated 21 June 2002, an amendment to Decree 48 by the Government of Vietnam. Biologists discovered three rare orchid species. Orchids found here include: Paphiopedilum malipoense, Paphiopedilum dianthum, Paphiopedilum concolor. In 1996, IUCN classified these orchid species in danger of extinction in the near future. Endemic species in Phong Nha-Kẻ Bàng National Park include: Burretiodendron hsienmu, Cryptocarya lenticellata, Deutzianthus tonkinensis, Eberhardtia tonkinensis, Heritiera macrophylla, Hopea sp., Illicium parviflorum, Litsea baviensis, Madhuca pasquieri, Michelia foveolata, Peltophorum tonkinensis, Semecarpus annamensis, Sindora tonkinensis. The forests of Quảng Bình, particularly in Phong Nha-Kẻ Bàng, are home to at least 98 families, 256 genera and 381 species of vertebrates. 66 animal species are listed in Vietnam's Red Data Book and 23 other species in the World Red Book of Endangered Species. In 2005, a new species of gecko (Lygosoma boehmeiwas) was discovered here by a group of Vietnamese biologists together with biologists working for the park, Cologne Zoo in Germany and the Saint Petersburg Wild Zoology Institute in Russia. The gaur and one species of eel have been discovered in this park. 10 new species previously unknown in Vietnam were discovered by scientists in the park. Phong Nha-Kẻ Bàng is home as well to a significant population of primates in Vietnam, with ten species and sub-species. These include the globally vulnerable pig-tailed macaque, Assam macaque, stump-tailed macaque and white-cheeked crested gibbon (Nomascus leucogenys and Nomascus leucogenys siki). The park is home to one of the largest populations of François' langur in Vietnam, including two different forms of the species. The area is known for its population of Hatinh and black langurs. 10 species of bats listed in the IUCN List of Threatened Species are recorded in this park. Of the 59 recorded reptile and amphibian species, 18 are listed in Vietnam's Red Data Book and 6 are listed in the IUCN Red List of Threatened Animals. The 72 fish species include 4 species endemic to the area, including Chela quangbinhensis. The park is home to over 200 bird species, including such rare birds as the chestnut-necklaced partridge, red-collared woodpecker, brown hornbill, sooty babbler and the short-tailed scimitar babbler. An initiative survey conducted by Russian and Vietnamese scientists from Vietnam-Russia Tropical Centre (funded by WWF) recorded 259 butterfly species of 11 families. Almost all major butterfly taxa in Vietnam can be found in Phong Nha-Kẻ Bàng. They are further subdivided into 7 commune-level towns (or townlets), 136 communes, and 16 wards. These in turn are further subdivided into villages (lang or thon). Like administrative system of Vietnam, the leader of each administrative unit is the secretary of the local Communist Party Cell. Each administrative unit includes a people's council, who elects a people's committee to execute its daily affairs. The province is home to Quảng Bình University, a newly established university from the Normal College of Quảng Bình. This university has faculties of business administration, normal faculty, informatics faculty. There are several high schools and primary schools in counties. Inhabitants here regards education as family tradition and the most important means to make ends meet and to eliminate poverty. Quảng Bình province is the land of rich culture and famous people. There is an archaeological site of Bàu Tró, Phù Lưu ancient bronze drums in the time of Dong Son's culture. On 3 July 2007, an earthen pot of ancient coins weighing 20 kg was found buried at 500 cm underground in a paddy field and later sold for US$12.5 per kilo. This site is located in Tran Xa village, Ham Ninh commune, Quảng Ninh district. The coins were from the Tang Dynasty period. Compared to other provinces in areas surrounding Hanoi and Hồ Chí Minh City and Đà Nẵng, Quảng Bình is the poorer province. Therefore, more and more young and educated here find their ways to the big cities and more industrialized provinces. In each commune (xã, a rural sudivision of district), there is a clinic and there is a hospital in every county, in Đồng Hới city, there are more. The Đồng Hới Hospital, which was donated by Cuba, was built in the 1980s. The province's agriculture is comprehensively developed with the direction of production of commodities. Crops and cultivation calendar have been gradually arranged in a more appropriate manner. The food production has been continuously increased reaching 200,000 tons in 2000. The total area of industrial trees is 14,105ha, of which the area of rubber is 6,400 ha providing 2,000 tons of dried resin. Cattle and husbandry keep growing. The average agriculture growth rate is 5.7% during the period 1996-2000. In the recent years, forestry production in Quảng Bình Province has been changed in terms of structure from mainly exploiting to protecting, developing forest for forest resource conservation. The value of forestry and afforestration has increased 87.3%, in particular from 1996 to 2000 the growth rate was 65.3%. The annual forestation area is around 4,000 ha. Up to date 38,851 ha of forest has been planted. The fishery sector has continuously developed and become a key economic sector of the province. At present the province has around 3,200 fishing boats with power of over 67,000CV. In the year 2000, the output of sea products is estimated at 17,104 tons, of which about 1,600 tons is from raising. The province has 3 shrimp nursery stations, 8 fish nursery stations supplying 5–7 mil. tiger baby shrimps, 40 - 45mil. baby fish and 4 - 5 mil. fingerlings annually. At present the province has 2 factories of processing frozen sea products and 4 factories of processing dried products for exportation. The services of fishing sector such as making and repairing ships, purchasing, processing sea products and providing technical assistance and infrastructure for fishing are continuously developed. However, the development of fishery sector in recent years has not met its expected potential. As of February 2008, the province licensed 59 investment projects with a total capitalization of USD $500,000,000. As of 2009, this province is home to two special economic zones with preferential investment and tax treatments, namely the Hòn La Economic Zone by the Hòn La seaport, and Cha Lo Border Gate Economic Zone in the border with Laos. Quảng Bình has several tourist attraction sites that could be turned into tourism development. Phong Nha-Kẻ Bàng National Park: This park features a karst region of more than 200,000 km2 if Hin Namno region in Laos bordering this park is combined. Phong Nha-Kẻ Bàng is a protected area, a national park and was listed in UNESCO's world heritage in 2003. Phong Nha-Kẻ Bàng is located in the Bố Trạch and Minh Hóa districts, in North Central Coast, Vietnam, about 50 km northwest of Đồng Hới, 42 km east of South China Sea from its borderline point. Phong Nha-Kẻ Bàng is situated in a limestone zone of 200,000 hectare in Vietnamese territory and borders another limestone of 200,000 hectare of Hin Namno in Laotian territory. The core zone of this national park covers 85,754 hectares and a buffer zone of 195,400 ha. The park was created to protect one of the world's two largest karst regions with 300 caves and grottoes and also protects the ecosystem of limestone forest of the Annamite Range region in North Central Coast of Vietnam. Phong Nha-Kẻ Bàng National Park is noted for its system of some 300 cave and grotto systems with a total length of about 70 km, of which only 20 have been surveyed by Vietnamese and British scientists; 17 of these are in located in the Phong Nha area and three in the Kẻ Bàng area. Phong Nha holds several world cave records, as it has the longest underground river, as well as the largest caverns and passageways. Following UNESCO listing of this park, the number of visitors to this province changed significantly. Tourists mainly visit Phong Nha, Tien Son and Thiên Đường caves and Hang Én. Sơn Đoòng Cave has yet available for visitors due to unavailability of access road and other relating facilities. Bang Spa: a hotspring area in Lệ Thủy District with resort and health care services. The temperature of the water at the jet hole can reach up to 105 degree Celsius. Ho Chi Minh trail, many important sites along the trail during Vietnam War. There are two parallel national roads cross the province: The National Route 1A (runs from Lạng Sơn Province to Cà Mau Province along the coastline of the country) and Hồ Chí Minh Highway (runs from North-Western part of Vietnam to Cà Mau along the mountainous part, nearly coinciding Ho Chi Minh trail). The Road 12 connects this province with Khammouane Province of Laos. The Hanoi–Saigon Railway crosses Quảng Bình Province in the hill area with Đồng Hới Railway Station as a main station. Part of the aborted Thakhek - Tan Ap railway would have crossed the province to connect with the North–South Railway at Tân Ấp Railway Station. Đồng Hới Airport is located in Đồng Hới city, initially due to be opened at the end of 2007 with scheduled flights to and from Hồ Chí Minh City's Tân Sơn Nhứt International Airport and Hanoi's Noi Bai International Airport upon completion. The construction schedule of the airport was late due to lack of capital from the government. It was scheduled to be completed in February 2008, but the deadline was extended again. According to the latest revised schedule, this airport will be completed and opened in 3rd quarter of 2008. The airport was officially inaugurated on 18 May 2008 with the first flight from Hanoi's Noi Bai International Airport, then from Hồ Chí Minh City on 1 July 2009. As of September 2009, the only airliner operating here is Vietnam Airlines with the destinations of Hanoi and Hồ Chí Minh City. There will be more air links between this airport and other airports in Vietnam soon. The airport has a designed capacity of 300 passengers per peak hour 500,000 passengers per annum. The provincial population is 807,787 (2000). There are 24 ethnic groups live here, predominantly Kinh, Vân Kiều and Chứt. Other minorities are in very small quantity with 100 persons each. All of 23 minority ethnic groups live in mountainous areas. The provincial population is unevenly distributed, with more than 90% live in around 10% of the provincial land while just 10% live in 90% mountainous and sand areas. 88.5% inhabitants lives in rural areas, 11.5% lives in urban areas. 47.08% of the population (380,306) was in the labor force in 2000, 72% of whom work in rural sectors (agriculture and syvicuture) and 10.9% in urban areas (industrial, service and commercial sectors). There are 10,720 university graduates and postgraduates (4,676 college graduates and 6042 university graduates) in 2000. Of blue-collar workers, only 35,000 have passed appropriate training courses. In 1926, a French archaeologist, Madeleine Colani, discovered and excavated many artifacts in caves and grottoes in west mountainous areas of Quảng Bình. She concluded that the Hòa Bình culture belonged to this region. Through C14 dating test, the artifacts dated back to 10,509 (plus or minus 950) years ago. From Quy Đạt township (in Minh Hóa District) to 150 m southwest, the Hum grotto contains many stone tools and animal stones from an ancient human community. Inside the Khai grotto near Quy Đạt township, similar artifacts were also found. Especially, there are several ceramics of Dong Son culture. Additionally, artifacts from the Stone Age were unearthed in some grottoes in Quảng Bình. Owners of these artifacts lived in the caves and grottoes and hunted for their food.